Webmaster's note: This article first appeared in issue 963 of 'Railway Magazine, July 1981. It is, perhaps, not to difficult to guess the real identity of writer 'Rooinek'. South African Railways "26" class 4-8-4 No.3450, "L.D.Porta" (nicknamed the "Red Devil"), at Paarden Eiland shed, Cape Town, on February 10, 1982. Photo: "Rooinek"
Recently completed extensive modifications to a class "25NC" non-condensing 4-8-4 locomotive of the South African Railways could possibly lead to a new lease of life for the steam locomotive. To the design of mechanical engineer D.Wardale of the SAR, an otherwise standard locomotive was rebuilt and modified, with the intention of increasing efficiency using in part already established ideas plus various original features. The aim, as always, was to obtain more steam for less fuel consumed, and to utilise steam with maximum efficiency. 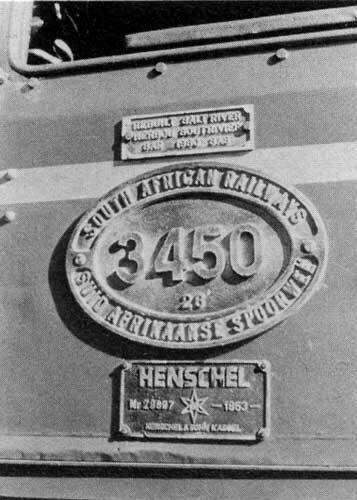 To this end locomotive No.3450 (built by Henschel & Sohn in 1953, No.28697) was selected for attention by the staff of SAR mechanical engineering workshop at Salt River, Cape Town. Actual physical work commenced with the manufacture of new components at the end of 1979, this being preceded by about then months of preparation of detailed drawings and calculations done at the SAR headquarters in Pretoria. Design work was still being undertaken after the manufacture of the first components had commenced. All new items and modifications to existing parts were carried out at Salt River, Bloemfontein, Kimberley (Beaconsfield), Koedoespoort and Pietermaritzburg, items being manufactured or modified by the particular workshop best suited to the task at the time. It is well worth noting that during the entire period the modifications were being carried out at the works considerable interest and enthusiasm for the project was shown by those directly involved at shop-floor level. No.3450, as yet without nameplates, at Paarden Eiland shed, Cape Town, just before its first light test run on February 6, 1981. 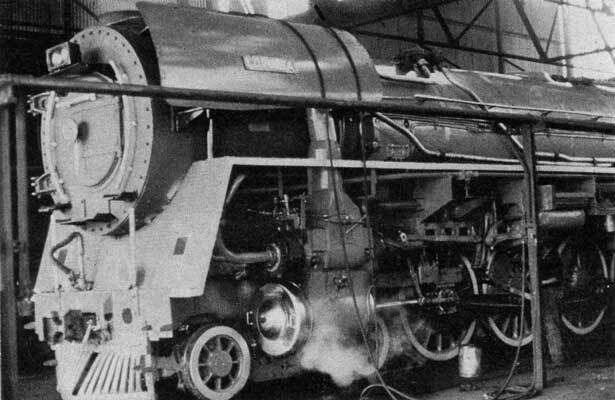 Photo: "Rooinek"
Some lessons learned on modifications previously carried out to the firebox and smokebox of a class "19D" 4-8-2 were incorporated on No.3450 with additional new features, the primary objective being to improve combustion and steaming rate while at the same time to reduce the emission of black smoke, and to overcome the problem of clinkering. The was achieved by the use of a single-stage gas producer. Basically, this relies on the gasification of coal on a low temperature firebed; the gases then released are fully burnt above the firebed. A minimum of air is introduced through the firebed, the main source of air required for the main combustion area being drawn through ancillary air intakes located above the firebed. Additional major changes include the the lengthening of the smokebox to incorporate a double Lempor exhaust with offset double chimney and a feedwater-heater located between the chimneys. Redesigned valve liners are used incorporating streamlined ports to the cylinders, the rings and liners being made of very hard chromium cast iron. Improved lubrication techniques are used to enable the oil to get directly to where it is most needed on the cylinder and valve liner rubbing surfaces. 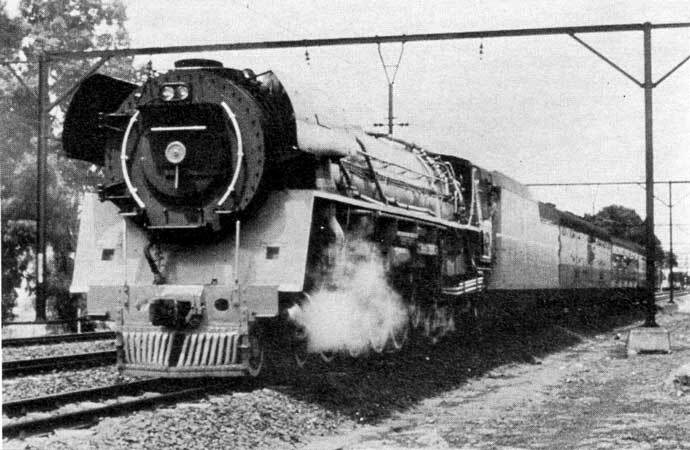 Other major modifications include increased superheat, superheat booster, new piston valves, articulated valve spindles, new cooled valve liners, new cylinder liners, altered valve gear, Herdner starting valves, air sanding, altered self-cleaning smokebox, larger steam chests, direct steam pipes, improved pistons, improved valve and piston rod packings, variable stroke lubricator drive, improved insulation, and many minor detail improvements. Calculations for the final dimensions of the Walschaerts valve gear were made of a computer. The locomotive is fitted with Continental European style exhaust deflectors curved round but not parallel to the smokebox. The coal capacity has been increased from 18 to about 20 tonnes; the total weight of the unit in full running order has been increased from 225 to about 230 tonnes. The locomotive has been designated class "26". Salt River Works rebuild plate; SAR number plate, showing new class designation "26"; and original Henschel maker's plate, No.28697 of 1953. Photo: "Rooinek"
On Thursday, February 5, 1981, all was ready for the initial steaming. The fire was lit at 10.00, steam being raised some three hours later, and after a few steam leaks were dealt with the locomotive made its inaugural run of a few yards on tracks inside the works. After a few adjustments the locomotive was then ready for its initial test trip, which was made the next day, running light from Salt River to Belleville and back on the mainline, a distance of about 20 km (12½ miles). The only untoward event discovered on this run was an apparent shortage of lubricant to the cylinders on the return trip. This was eventually diagnosed as being caused by a faulty oil pump, which was attended to on return to the works. Monday, February 9, saw No.3450, now bearing its exhaust deflectors the name L.D.Porta after an Argentinean railway locomotive engineer, some of whose ideas and developments have been incorporated, emerged from Salt River works with red paintwork shining, brass and copperwork gleaming, and sporting the SAR emblem on its tender, ready to pull its first train. The train, of three coaches (one suburban swing-door of antique lineage flanked by two full brakes) was to carry various railway officials and staff on the electrified line to Dal Josafat, some 66km (41 miles) from Cape Town, where there is a triangle enabling the locomotive to be turned. For this notable occasion the South African Broadcasting Corporation sent a reporter and cameraman to record the event and interview a spokesman of the Railway administration, the film being screened on the next day's evening news programme. 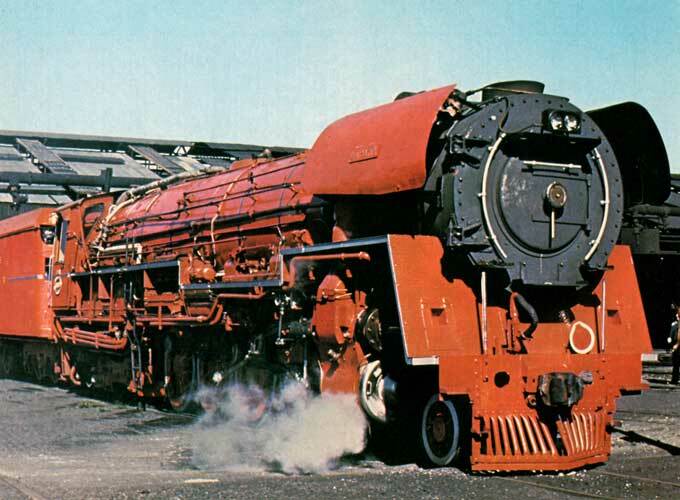 Considerable interest has also been shown in the locomotive by the Cape Town press, which subsequently published colour photographs of the locomotive dubbing it the "Red Devil". No.3450 "L.D.Porta", and the three coach test train on February 9. Photo "Rooinek"
South Africa is very aware of its dependence on imported oil fuel, and any project which can utilise locally available solid fuel, of which there are very large reserves, is always newsworthy. The journey to Dal Josafat and back was accomplished without mishap, the locomotive performing well. The SAR personnel on the train all seemed duly impressed and enjoyed their trip out. These aforementioned journeys were made without the brick arch being fitted in the firebox, this work being a function of the shed and not the works. Next day No.3450, after having the brick arch fitted and boiler washed out at Paarden Eiland shed, which adjoins the Salt River works and is the works' home shed, departed in the evening for Kimberley. Tuning-up work is being done at Pretoria as required during working between Pretoria and Witbank, a severely graded line, after which No.3450 will return to Kimberley (Beaconsfield) and enter normal traffic, its performance to be fully evaluated in regular working. No specific details regarding performance are being released by the railway authorities until the period of evaluation is completed, but savings of approximately 35% on coal and 25% on water used are expected. It will readily be appreciated that such savings as this could result in a most interesting snowball effect with internal railway costs of transporting coal for locomotive consumption from the pithead to the depot being reduced when hauled by this or similarly modified locomotives, with a consequent reduction in costs in the running of the locomotive itself. The anticipated increase in power, needless to say, could show savings in such running economies as quicker turnround, with subsequent reduction of stop-overs for crew, as well as the more obvious ability to haul heavier (subject to any adhesion limitations) or faster trains. The results of this development are now eagerly awaited, and may form an interesting article for the future. Raising steam at Paarden Eiland shed on February 10, before the test run to Kimberley. Note the compressor air lines for forced draught. Photo: "Rooinek"
Readers wanting to know more are advised to track down a copy of David Wardale's book "The Red Devil and Other Tales from the Age of Steam".